While defense wins championships, a team still needs enough offense to win the game. 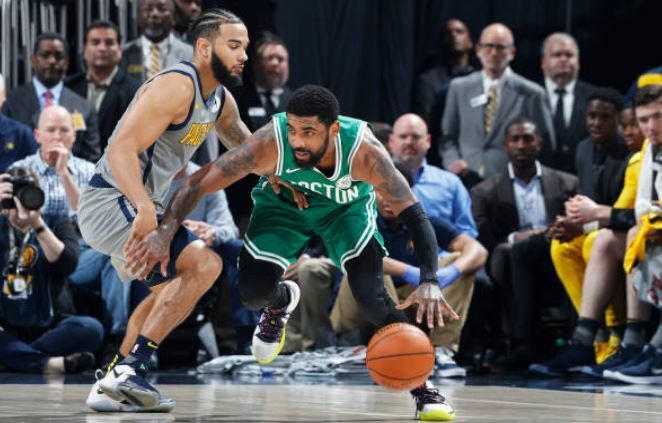 In a hard-fought defensive battle Sunday afternoon, the Celtics happened to have just a little more offense than the Pacers. It didn’t look too good for the Celtics early on. Indiana led by as much as eight in the first quarter, but Boston was able to battle back and tie the game up heading into the second quarter, 20-20. In the second, the Pacers offense woke up a little and managed to give Indiana a seven-point lead going into halftime, 45-38. But whatever Celtics head coach Brad Stevens told the team at halftime worked wonders. Boston started the half with an 11-point run to take the lead, 49-45, with 7:17 to go in the quarter. With a few minutes, the Celtics pushed the lead out a little further, to 12-points, 60-48. Terry Rozier hit a 27-footer to give the Celtics an 11-point lead heading into the fourth, 64-53. Indiana ended up going a dismal 2-19 from the field. Boston led by as much as 19 points in the down the stretch but settled for a ten-point win, 84-74. The Celtics got the win, but luckily style points don’t count. They shot only 36 percent from the field, committed 20 turnovers, and won for the first tie this season while scoring less than 100 points. Indiana played good enough defense to win the game but struggled to hit a basket from anywhere. They were 28-84 from the floor, just 6-27 from three-point range, and were even worse at the free throw line (12-21). Kyrie Irving and Marcus Morris ended up leading the way for the Celtics with 20 points each followed by Jayson Tatum with 15. Jaylen Brown got the start for Marcus Smart, who is out with a torn oblique, and made just one of the five shots he attempted. Bojan Bogdanovic was the only starter to score in double figures for the Pacers with 12 points. Cory Joseph led the team off the bench with 14. Both teams will have a few days to try to figure out how to generate some offense. Game Two at the TD Garden in Boston will not be until Wednesday night. The opening line has the Celtics as a 7.5 point favorite (money line: Boston– -350; Indiana– +275).